- Stand and balance yourself on one foot. Grab your ankle from behind and pull your heel towards your buttocks. Hold the stretch for at least 30 seconds. Release and switch legs. - Weave your fingers together and press your palms towards the sky. Lean to one side and then slowly to the other. Hold for at least 15 seconds on each side. - Put your arms around yourself and "hug" yourself. Rotate back and forth to each side slowly. - Finally, chiropractic care can help! Read more about gardening tips and tricks for your body. 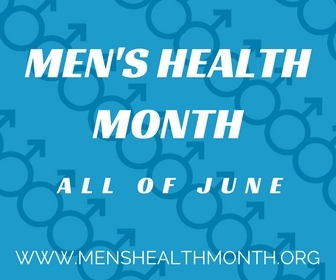 During the month of June, we bring awareness to men's health issues. There are several key factors and things you can do to participate and help yourself (or the men in your lives). Get screened! HPV also affects men and most men never know they have it, but it can cause cancer. 1 in 2 men get cancer in their lifetime; for women it's 1 in 3. Regular check ups with your doctor can help keep you healthy and disease free. June 15th is wear blue day to show support for men's health awareness. Wear blue to show your support and spread awareness about preventable diseases and early detection in men and boys. Spring is here! Get on that bike! We live in Portland and cycling is a part of our nature. There are some tips and things to watch out for as you get out there in this spring time weather. First, there's the fit of the bike. There are three main components to align for your body: frame height, seat position/ height, and handlebar height. For the frame, your leg length should be the primary factor that helps determine this. It should be easily straddled with both feet flat on the ground and an inch or two of clearance between the top of the frame and your crotch. On a mountain bike, you may want up to four inches for rugged terrain. Seat position and height should be determined while seated on the bike. Sitting on the seat with the ball of your foot on the pedal, at the lowest position of the pedal, your knee should be slightly bent. As for position, the seat should be level to avoid unnecessary strain on joints. Handlebar position should be determined by what is comfortable for the rider and feels like it's putting the least amount of strain on the joints. Higher is more comfortable and lower is more aerodynamic. In addition to fit, there are different types of bikes for different terrains. Choosing the right bike for your activity is important because they are designed for the impacts and rigors of the specific exercise. You can read more from the ACA here. One of the most diagnosed health conditions in the USA is low back pain. People who go to see their chiropractor are less likely to be sent for surgery or prescribed pain killers. A recent study showed that 60% of opioid overdoses were people that were originally prescribed pain killers for chronic, non-cancer pain. Another study has shown that chiropractic care can help relieve pain and reduce the amount of prescription pain killers people take. The study was done by researchers at Southern California University and showed that the likelihood of someone filling a prescription for an opioid analgesic was 55% lower among those receiving chiropractic care. A summary article about chiropractic care and opioids can be read here. Read the abstract for the Southern California University study here.